Follow these steps before and after trade shows to be successful. Half of the b-to-b marketers I know love trade shows. The other half hates them. What’s the difference? Those who think trade shows are great understand that some work has to be done before and after the show in order to be successful. Those who don’t like trade shows seem to simply set up their booths, then stand around waiting for qualified prospects to wander by and identify themselves. Getting people to visit your booth requires that you do a number of activities – from scheduling visits with prospects to advertising your event. The following preshow promotional activities can help you generate more qualified booth traffic – and guarantee you won’t be standing around. Send free exhibit passes to past inquirers and other prospect lists – Go through your in-house database looking for people who have expressed interest in your products or services in the past. Once you have a list in hand, send these prospects free exhibit passes, which are often available at no charge from show management. Call hot prospects and key customers, and encourage them to visit your booth – People love to feel special, and you can use this to your advantage by personally inviting people to visit your booth. Offer a reason for visiting – a special premium just for them or a one-to-one demo if applicable – or just let them know that you’ll have new products or services available for preview. Post your event dates in print and online – Include taglines such as “See us at Booth 1525 at Widgets Expo” on print ads, in direct mail letters and even as part of your e-mail signature. Post all your company’s events on your Website, and make sure they get into your company’s e-newsletters. Ensure that you’re up-to-date on new products and services – Companies generally hold sales and training meetings before shows, but if yours doesn’t, or if for some reason you missed the meeting, get the material and study it. Ensure that you understand what new products and services are being offered and any new company policies that are being announced. Rush qualified leads to your sales force – Don’t hang on to qualified leads! 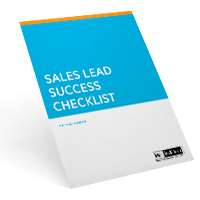 Get them to salespeople, reps, dealers or distributors for follow-up as quickly as possible. Follow up with your longer-term prospects – “Warm” leads are still good – but they need to be put into a lead-nurturing program. Instead of dumping these not-yet-qualified leads on sales, use the phone, mail, fax and e-mail to keep in touch with and qualify prospects with longer-term needs. Become a trade show success story by following the tactics outlined above. You’ll turn a “bust” marketing activity into one that pays high dividends.